Owen Farrell's tackle on Andre Esterhuizen in the dying seconds of England's victory over the Springboks on Saturday was, under the current laws, perfectly legal. The referee, TMO and citing officer agree. It was below the shoulder line - so not high, did not make contact with the head - so not dangerous and it was not - as many people claim - a "no arms" tackle. Farrell went to use both arms but was unable to wrap his arms in the tackle due to the force of the impact as both players launched themselves into contact, Esterhuizen's upper arm/forearm slamming into Farrell's chest on impact at the same time as Farrell's shoulder connected with Esterhuizen's chest. The question of whether such a tackle ought to be legal is a different one. The big chest-high hit should, in my opinion, be outlawed in the interests of player safety and indeed the RFU are this season trialling a law in the Championship Cup which requires the height of a legal tackle to be below the armpits. 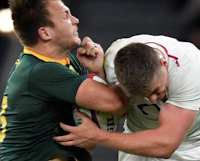 By the way, although clearly I was wrong about England taking a beating at the hands of the Springboks, there were times in the first half on Saturday when the floodgates looked about to burst open. The fact that England defended so resolutely and worked so tirelessly to stem the tide does bode well, although if next week the All Blacks have anywhere near the amount of possession afforded to South Africa we could be in for a difficult afternoon. Still, a win is a win. Onwards and, hopefully, upwards.